Chest pain is one of the most common symptoms presented in the emergency department (ED), and it is worrisome because the differential diagnosis widely range between non-emergent conditions and life-threatening conditions such as acute coronary syndromes (ACS), pulmonary embolism (PE), aortic dissection, pericarditis with tamponade, pneumothorax, and esophageal rupture. Chest pain caused by non–emergent conditions include esophageal reflux, peptic ulcer, biliary colic, muscle strain, costochondritis, pleurisy, pneumonia and non-specific chest wall pain. 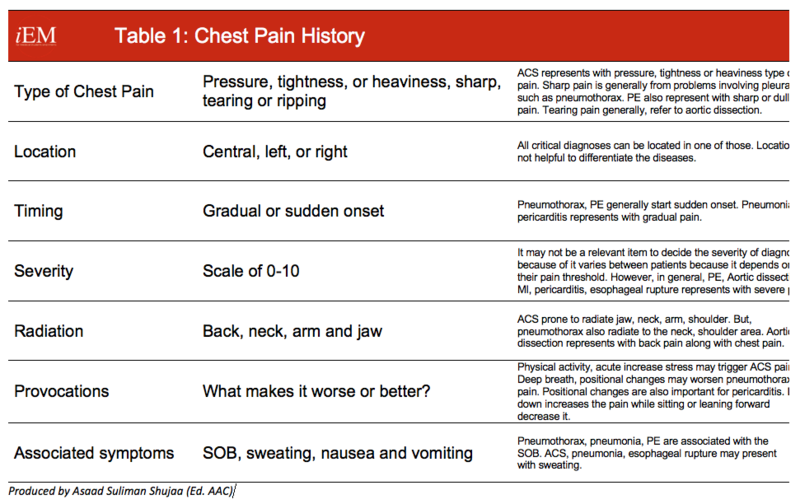 It is important as emergency physicians to have an approach to chest pain that enables one to recognize life-threatening conditions from non-emergent conditions. This chapter aims to discuss how to approach a patient with chest pain. Currently, we do not have data regarding how many patients visit the ED with chest pain in the Middle East; however, in the USA, approximately 6 million patients visit ED with chest pain, which accounts for almost 9% of all ED cases. This makes it the second most common complaint in ED visits. Assessment of the airway by being able to talk without distress, no obvious upper airway obstruction such as tongue swelling, lip swelling, hoarseness, etc. Assessment of breathing by listening to the pulmonary sounds. Is it equal or wet (basal crackles indicate CHF)? Assessment of circulation by listening to heart sounds. Are there any S3,4 gallop rhythm (CHF) or new murmurs such as mitral regurgitation (papillary muscle dysfunction). Checking the pulses, capillary refill to understand the shock situation. Vital signs should be assessed and repeated at regular intervals. For example, respiratory distress with low O2 saturation may indicate pulmonary edema, plus low BP indicates cardiogenic shock. Also, unequal BP in both arm or pulse deficient indicates aortic dissection. Electrocardiogram (ECG): To interpret myocardial ischemia, arrhythmias, pericarditis, and right ventricular strain findings for PE. Any abnormality found in the initial approach may need immediate actions. What types of questions would you like to ask? Are you having discomfort, chest pain? Time of onset or acute worsening? Has there been any progression? Risk factors for coronary disease such as hypertension, diabetes, high cholesterol, obesity, male, family history, smoker, sedentary, post-menopausal, previous history of ACS and family history of CAD. Risk factors for pulmonary embolism such as travel history, oral contraceptive use etc. And risk factors for other critical diagnoses. Repeat assessment of the airway, breathing, and circulation with full examination steps. Look for swelling in legs (lower limb edema), calf tenderness (deep vein thrombosis). ECG is the main bedside test for any chest pain patient. What is your opinion about below ECGs in patients with different type of chest pain? Case – 54 yo female presented with 3 days history of righ side chest pain (pleuritic). Case – 46 yo male presented with central chest pain. He has nausea and diaphoresis. Any ST elevation in 2 contiguous leads should be evaluated as S.T. Elevation M.I. However, please do remember, there are many other problems can elevate S.T. segment. In Acute Myocardial Infarction ECG has 50% sensitivity, 90% specificity. 12 lead ECG for PE may show S1 Q3 T3 sign (prominent S wave in the lead I, Q wave and inverted T wave in the lead III). It is a sign of acute right ventricular strain (acute pressure and volume overload of the right ventricle because of pulmonary hypertension). Other ECG findings noted during the acute phase of a PE include new right bundle branch block (complete or incomplete), rightward shift of the QRS axis, ST-segment elevation in V1 and aVR, generalized low amplitude QRS complexes, atrial premature contractions, sinus tachycardia, atrial fibrillation/flutter, and T wave inversions in leads V1-V4. The ECG is often abnormal in PE, but findings are neither sensitive nor specific for the diagnosis of PE. The greatest utility of the ECG in a patient with suspected PE is ruling out other life-threatening diagnoses such as acute myocardial infarction. Some aortic dissection cases may also show ST-segment elevation as in acute myocardial infarction. ECG may also help to diagnose pericarditis, especially chest pain patients with fever. Complete blood count, ESR, C reactive protein, blood culture, and lactate may help to rule out some infections such as pericarditis or mediastinitis because of esophageal rupture. But, their value in the acute setting is questionable. To look for heart failure and evaluate for other cause of chest pain such as Aortic Dissection, pneumothorax, pneumonia etc. Widened mediastinum, abnormal aortic knob, pleural effusions for aortic dissection. These findings are not sensitive for the aortic dissection. Only 25% of the patients have wide mediastinum. Esophageal rupture signs in chest X-ray; Hydropneumothorax, Pneumothorax, Pneumomediastinum, Subcutaneous Emphysema, Mediastinal widening without emphysema, Subdiaphragmatic air and Pleural Effusion. What is your opinion about below chest x-ray in a patient with chest pain? Case – 58 yo male presented with 1 day history of sudden onset lef side chest pain radiating to left shoulder. CT with contrast shows large, central emboli, it is also very sensitive for aortic dissection. In the suspicion of esophageal rupture, contrast-enhanced CT scan of the chest should be obtained if it is not possible to obtain a contrast esophagogram, if the esophagogram was negative, despite a high clinical suspicion, or if seeking to evaluate for a more likely alternative diagnosis. Perforation may be suggested by mediastinal air, extravasated luminal contrast, peri-esophageal fluid collections, pleural effusions, or actual communication of an air-filled esophagus with an adjacent mediastinal air-fluid collection. Definitive esophageal communication with outside structures is often difficult to visualize. The pulmonary angiogram is the gold standard for PE and aortic dissection but carries a risk of contrast-induced nephrotoxicity and anaphylactic contrast reaction. V/Q scan very sensitive but not specific for patients with suspected PE. Depending on your history, physical exam and bedside investigations as well as laboratory and imaging results, the focus should be given to rule out myocardial ischemia or infarction, pulmonary embolus, pneumothorax, pericarditis with tamponade, aortic dissection, and esophageal rupture. Each of this specific disease entities has various risk stratification methods, treatment options, and dispositions. Now, it is time to look to some cases and discuss more specific management in the ED. A 46-year-old male with a history of diabetes mellitus, hypertension, and coronary artery disease presents to the ED. He is a smoker. He complains of chest tightness and heaviness. The symptom started gradually 3 hours ago and lasts 20 minutes when he was watching TV. The pain scale was 5/10, radiated to his jaw. The pain is associated with nausea and sweating. He took Nitroglycerin spray, and the pain was relieved. The pain started again before he reached the ED. The pain scale is 10/10. The initial assessment at triage: ABC intact, BP: 140/80, HR: 110 RR: 24, O2Sat: 98% on room air, Temperature: 37.3, Random Blood Sugar: normal. A 30-year-old male had an open reduction and internal fixation (ORIF) of right ankle fracture 2 weeks ago. C/O sudden onset of chest pain today. He has pleuritic sharp chest pain associated with short breath, increased during inspiration. The quick history that suggested the patient had a major surgery 2 weeks ago and was immobilized 2 weeks. Unfractionated: 80 u/kg bolus, 18 h/kg/hr. No study has shown a survival benefit, but it is very difficult to study. A 60-year-old male patient presented to the ED with sudden onset central chest pain, described as ripping his chest and radiating to the back, no associated symptoms and patient, previous history with HTN, CAD, and smoker. Initial assessment by EMS was ABC intact. Vitals were BP 190/95 Right arm, Pulse 110, RR 20 , T 37 , O2sat 98%. Quick history which suggested sudden onset central chest pain, described as ripping his chest and radiating to the back, no associated symptoms. There are abdominal and bilateral femoral bruits, with absent distal pulses. The chest Pain is sudden onset central ripping chest pain radiating to back as in aortic dissection; the pain is not angina pain. Involve Cardio-Thoracic surgery as soon as possible. If dissection is only descending, management is only supportive. A 55-year-old alcoholic with persistent vomiting presents with sudden onset of Chest Pain followed by hematemesis. The chest pain is sudden onset, sharp in nature, radiating to the back. It is associated with shortness of breath for 3 hours. Past medical history: DM, HTN, alcoholic, and smoker. Vitals: BP 120/80 equal bilateral arm, pulse 90 regular and equal on four limbs, no pulse deficit, RR 40, T 38, O2sat 96% on room air. The quick history which suggested the sudden onset of Chest Pain followed by hematemesis. The chest pain is sudden onset, sharp in nature radiating to the back; it is associated with shortness of breath for 3 hours. Portable CXR shows left pleural effusion and pneumomediastinum and normal width of the mediastinum. The chest pain is sudden onset followed by hematemesis. The chest pain is sharp in nature radiating to the back; it is associated with shortness of breath for 3 hours. A history of repeated vomiting and associated with short of breath and vomiting blood (hematemesis). Broad-spectrum antibiotics – No randomized clinical trials exist for antibiotics and esophageal perforation; however, empiric coverage for anaerobic and both gram-negative and gram-positive aerobes should be initiated when the initial diagnosis is suspected. Niska R , Bhuiya F, Xu J. 2007 Emergency department summary. Natl Health Stat Report ,(26):1 2010 . Chan TC, Vilke GM, Pollack M, Brady WJ. Electrocardiographic manifestations: pulmonary embolism. J Emerg Med. 2001 Oct;21(3):263–70. Ullman E, Brady WJ, Perron AD, Chan T, Mattu A. Electrocardiographic manifestations of pulmonary embolism. Am J Emerg Med. 2001 Oct;19(6):514–9.